Breast Cancer – How you can become aware here at University of Iowa. Your body is built to protect you and fix yourself. It’s your personal bouncer and it’s like your mother in the sense it takes care of you. But what happens when a foreign mutation comes in the body? Keri Mercer, a Cancer Information Specialist at University of Iowa Hospitals and Clinics, explains that your body has a kill switch. When cells divide, sometimes the mutations divides and that shut off the kill switch. This is why cancer is more rare in younger women, because younger women’s’ cells haven’t been dividing as long. When breast cancer does happen to women under 30 or so, it’s usually because of genetics. Breast cancer as well has different types, even if you take two women who both have breast cancer and are in the same stage; they may have a different type of cancer than each other. Here in Iowa City, the University of Iowa Hospital and Clinics reaches out to the community to try to help them understand cancer and how to catch symptoms. Sometimes some organizations contact them and ask them to come and speak about a certain cancer. Because there are so many different types of cancer, the UIHC tries to focus on the cancer involved in the cancer awareness month. For example, breast cancer is the main focus for the month of October, as it is everywhere else. Recently, the protocol for women getting mammograms has changed. It used to be women were advised to get them once they turned 40 years old, now it is 50 years old. Mercer said they are waiting to do testing later because breast tissue is different. When younger the tissue is denser, which makes it harder to see cancer cells. For younger women there is no screening. Mercer says that if you are in a high risk family and have women in the family who diagnosed younger than 40 – they look at your history and recommend the patient who had/has the cancer, get testing done to see if he/she has a mutation (because of insurance). Doctors tend to tell the patients to have the person with the cancer to be tested for the gene and if its positive then see if the person with the mutation has it and if has it there are some things to think about doing from there. Chelsea Stanley, a junior here at UI, has a long history of breast cancer being common in her family. Mercer says that the awareness not only comes from families, and family history or knowing someone with breast cancer, but it also comes from primary care doctors. Ask you primary care doctors about symptoms, have them check something if you think it is suspicious and they can also refer you to more information or a doctor who may be a specialist in cancer. Here at University of Iowa, student may make an appointment with Student Health Services to speak with a doctor or to get something checked out. They also may have some extra information. University of Iowa Hospital and Clinics also have a lot of resources available to students. In Johnson County, there have been 342 cases of breast cancer from 2003-2007 according to the Iowa Cancer Registry, 42 of which have died from it. Houses and apartments for rent make up the vast majority of residential property near downtown Iowa City, and most of the tenants are university students, creating unique problems for property managers and renters alike. 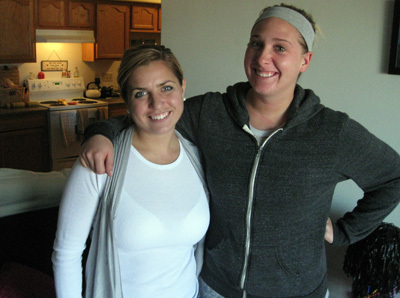 Madison Sheets and Amanda Leppert moved into their downtown Iowa City apartment this year because it was, in a word, “easy.” The University of Iowa seniors were friends with a tenant who already lived in the building, and signing a lease with her eliminated the need for an arduous apartment search or long lines at leasing offices. But the girls’ first few months living in Three Towers, near the intersection of Gilbert and Burlington streets, hasn’t been as easy as signing the lease. The building — which is managed by Apartments Downtown — consists mostly of college-age tenants. Sheets and Leppert said they’ve lived in other student apartment buildings from the same property managers, but they’ve never lived in a building with as much partying or building damage as Three Towers. “I called [Apartments Downtown] about stuff that was going on in the apartment and [an employee] told me that I should just call the police and not them, because they can’t really do anything if a kid’s like, throwing up in the hallway,” Sheets said. Security cameras are hoisted to the tops of walls on each floor, protected by plastic casing. They’re a recent addition to the building after apartment parties this fall led to damages in the building ranging from inexplicable burn marks on the stairwell carpet to urine stains. Leppert said she caught a man urinating in the front foyer of the building on the weekend of a football game. She threatened to call the police, but he was undeterred. “I screamed at him, and then he said, ‘It’s okay, I live here,’ ” Leppert said. Sheets and Leppert said that although their property managers have generally been helpful and responsive to other requests, they haven’t been successful in taming their rowdier tenants. Since the bar age in Iowa City increased from 19 to 21, Leppert said she’s also noticed an increase of partying in the building. There used to be a “bar break,” she explained, but more underage students are hosting apartment parties because the 21-ordinance has left them with few other options. “There’s people below us that party, there’s people next to us that party. It’s the whole building,” Sheets said. Sheets, Leppert and their two roommates each pay $510 per month in rent plus the cost of utilities. The girls are graduating this spring, but even if they weren’t, both said they wouldn’t stay in the building, despite its proximity to downtown Iowa City. Apartments Downtown did not respond to interview requests. The business is registered to James Clark, according to the Iowa Secretary of State website, and has been registered to Clark since September 1972. One of Clark’s early developments was Pentacrest Apartments in 1978, near the intersection of Burlington and Capitol Streets. The state of Iowa requires some businesses to register their DBA names. Using “fictitious” or DBA names is completely legal, according to the Iowa Secretary of State. Among other business names that have been or are currently registered to Clark are Associated University Realty, AUR Downtown Apartments, DTA Iowa City Inc. and Iowa City Maintenance. Apartments Near Campus declined requests for an interview. Although Clark owns an enormous amount of student rental properties in downtown Iowa City, myriad other small and mid-size property management companies also rent to students. Heritage Property Management, which owns a number of Iowa City-area rental properties, did not respond to requests for an interview. Prestige Properties, LLC was unavailable for comment at the time of publication. Occasionally, the issues between a student renter and his or her landlord extend beyond the usual noise and party complaints. Student Legal Services at the University of Iowa offers legal advice to students facing a range of issues from drinking tickets to divorces. Landlord-tenant disputes make up the largest number of civil issues that students bring to Student Legal Services, Supervising Attorney Greg Bal said. The most common dispute is over the landlord’s failure to return the rental deposit. In the 3 1/2 years Bal has been at Student Legal Services, the organization has only lost one case against a landlord. “We do see certain companies’ names come up more often than others, but I’m not sure if that’s because they’re not complying with the law … or if it’s just because they happen to have more apartments,” Bal said. Many students embrace the challenges of renting downtown in exchange for relatively low rent costs and close proximity to campus. Although the rental market is dominated by students, many students don’t think the market saturation is a deterrent to home buyers. Lauren Connolly, a senior at the University of Iowa, lives in a 3-bedroom apartment in Van Buren Village on South Van Buren Street. The building is managed by Heritage, and although there are a few unappealing aspects of the area — namely, its location next to the train tracks and some neighbors’ “pot-smoking habits” — Connolly said she’s happy in the building, and with her low $300 monthly rent payment. Connolly doesn’t think the abundance of student housing near downtown should necessarily scare people out of looking to purchase a home. “I’m sure it would affect older couples and people with young children more than it would affect first time home buyers looking for a cheap, fun place to lay down roots,” she said. Interested in the other side of downtown housing? Click here to read the rest of the package, including photos and a tour of a high-rise condominium building in Iowa City. Green methods could help solve wastewater problems in small Iowa towns. Iowa has more than 700 unsewered communities that discharge 1.2 billion gallons of poorly treated sewage in to the state’s waters, according to two separate studies by the Iowa Department of Natural Resources cited in a 2005 Iowa Policy Project report. And upgrading those systems to meet new federal standards would cost millions of dollars. But help may be on the way for those cash-strapped towns, according to Iowa researchers, if the state allows them to give it. 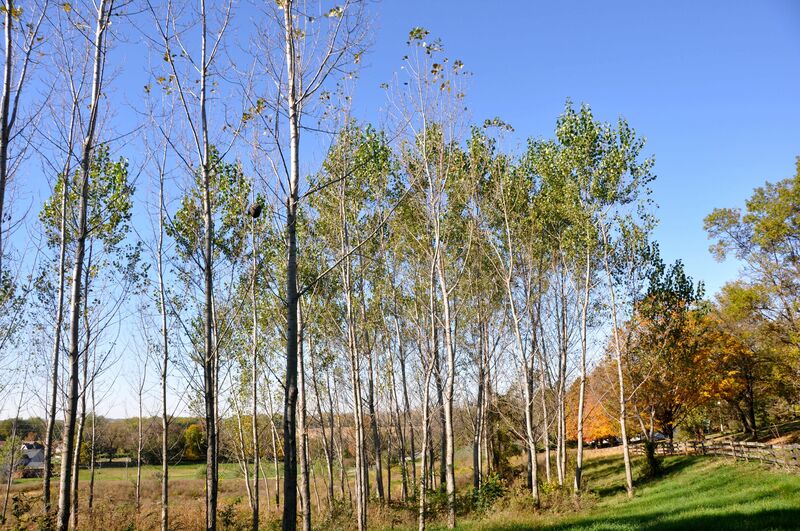 Lou Licht, a native of Lowden and owner of the North Liberty-based firm Ecolotree, has developed a method to filter wastewater using poplar trees that he touts as a cleaner, cheaper form of wastewater treatment. And University of Iowa professors Gene Parkin and Craig Just are researching a hybrid natural and mechanical method of water treatment on a micro wetlands site set up on the grounds of a water treatment plant in south Iowa City. Licht’s technology takes up more land, but burns less energy than its hybrid counterpart, said Parkin. “And when it’s good to go, what’s the deal?” he asked while sitting on the deck of his North Liberty home. While Licht has been permitted to complete wastewater projects in handfuls of states, Iowa is not one of them. Satya Chenuptai, who heads the wastewater section of the state’s Department of Natural Resources said the department can’t permit work like Licht’s without seeing data showing that it works in Iowa’s unique set of environmental conditions – frozen ground in the winter and waste that is filled with ammonia. Anne Alexander, a post-doc in environmental engineering at the University of Iowa, who interned with Ecolotree, said Licht’s system should treat ammonia and work in winter as soil temperature a few feet below ground stays near 54 degrees year round. The system treats less water in winter as poplars stop slurping and transpiring, but microbes continue to work below surface, she said. But Richard Leopold, director of Iowa’s DNR until last August, said in an email he can understand Chenuptai’s reservations. “The department can’t take risks on unproven technology,” he said, though not specifically addressing Licht’s research. Alexander said the DNR’s low budget likely stokes its fear of risk. Chenuptai would agree. He said that budget cuts have taken a toll at the DNR. Until recently, the department employed someone employed someone who devoted all hi time to researching innovation in wastewater treatment, he said. Just recently, the state cut the position. She’s not your average young adult: Work, volunteer, class and planning on her plate. She is a student who is involved with so much more than your average young adult. Most 20-something females worry about what they will do this weekend, what exams are coming up and just getting through the week. Not Lexi Schenk. Lexi is an ‘always on the go’ sophomore at the University of Iowa where she worries about; how am I going to get from STAT to work, how long should I run this morning to train for the marathon, and when will I get to talk to Tim next? She is involved with so much here at the University of Iowa all while she works at Applebee’s, and tries to plan her wedding to the handsome Marine, Tim Gunter. “Lexi is always gone! She’s either working, at class or at meetings for STAT and homecoming,” said one of her roommates Renea Juska. Lexi has always enjoyed volunteering in high school, especially in hospitals. On top of all her volunteering, Lexi is a psychology (pre-med) major. She also has a secondary major in Spanish. She is one dedicated girl, and always studying. She wants to be able to help with psychological problems affecting a person’s health including eating disorders and sports related psychological problems. In the end, she can help people while also enjoying what she does: a win, win situation for Lexi. Lexi isn’t even sure how much free time she gets to herself. She is an early rise so she always has the mornings to herself to run and relax. Lexi will be running in the marathon for Dance Marathon this October 10th. This is her 4th full marathon. Volunteering most of her time. Lexi got involved with everything here by simply going to a STAT meeting and was eager to start. Joining STAT has been the best decisions Lexi feels she has made since arriving at Iowa (minus saying ‘yes’ when Tim popped the question). Although Homecoming is a huge event and demands a lot of time and effort and is really stressful, Lexi loves it because she says it feels great to be apart of something bigger (it’s true, she loves it). “I am a very proactive person and I love challenges,” Lexi said. Determination is (one of) Lexi’s middle names. When she joined all these programs and received her positions, she decided she was going to make the events better than the years before. And when Lexi says that, she means it. “I admire her work ethic. She is always determined to finish what she starts and she gets it all done in a reasonable amount of time. She knows how to juggle all of her activities and I have no idea how she does it… I would go insane,” Renea said. But Lexi, somehow, manages to juggle it all. “Honestly, it not only makes me feel good about what I’m doing for other people, obviously that’s a big part, but it keeps me busy and motivated,” Lexi said. Lexi Schenk met Tim Gunter when she was junior in high school. He had just moved to Chicago from Boston and was being recruited into the Marines after his move: he was 19 and she was 17. From there it is your classic, heart-warming story: Tim and Lexi “clicked from the first day,” and what started out as just a friendship slowly turned into something more over a long period of time…it only took them two and a half years before they figured out that the rest of their lives were to be spent together. Like most young people in love, Lexi’s face lights up when she talks about Tim with a huge grin on her face. She always gets really excited, like a child on Christmas. Lexi may claim she has some Bridezilla moments, but the only Lexi we see is giddy-in-love Lexi. In the little free time Lexi has, she is running, cooking, reading, and watching movies, shopping and most recently, planning her wedding. This is Lexi’s last semester here at University of Iowa. 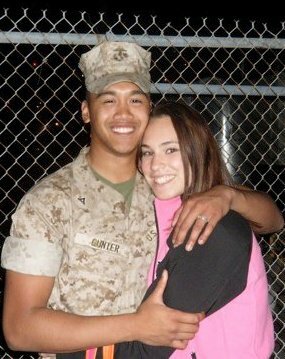 Next semester she is moving to California with her soon-to-be-Hubby, where he will be stationed. Lexi Schenk is very involved with the University of Iowa campus and generously donates much of her time all while showing her mad love and support for the Hawkeyes. Lexi is involved with Students Today, Alumni Tomorrow (STAT) at University of Iowa where she is on the Homecoming committee, she is also involved with Make A Wish Foundation, Dance Marathon, she works at the Applebee’s in Coralville; all while trying to plan her wedding in January and getting ready to transfer schools to be closer to her soon-to-be Marine hubby. For being only 19 and a sophomore taking a full course load, that is quite a lot to be involved with. More than most students can handle (I know I couldn’t do it all). Lexi isn’t the only one doing it. Volunteering has always been a ‘trend’ (for lack of better words). And in today’s economy, many people want to give and help out those who are struggling. Mandy Sharp is another giving individual who is volunteering just because. 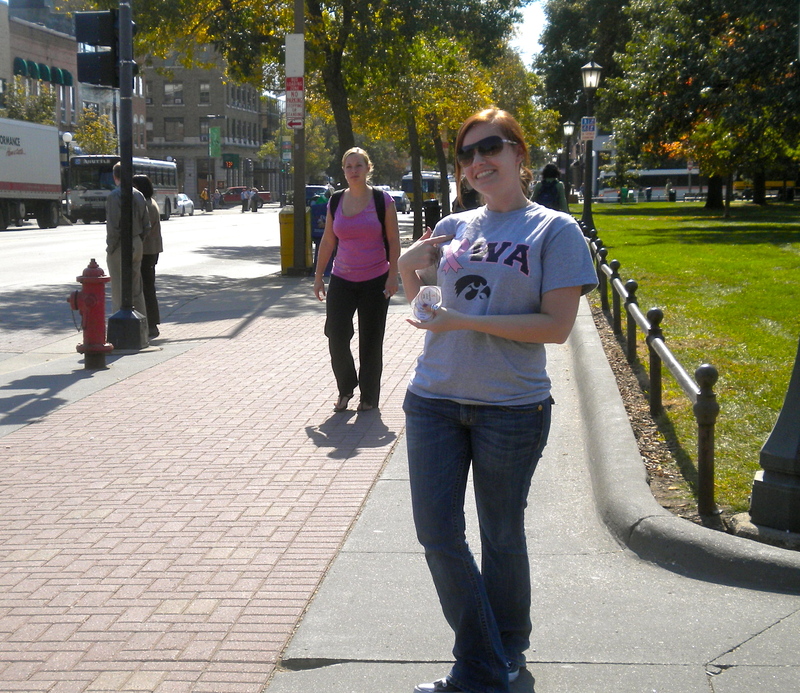 She pledges to donate 101 hours in Chicago starting on 9/11…in just a few days! I know I am sitting here in awe wondering why I slack so much and I feel ready to go volunteer. Well you can! There are plenty of people out there who are willing to help you out and give your more information. From University of Iowa? Check out Dance Marathon’s Facebook group and see what they are up to and talk to people and see how you can get involved. Maybe try STAT’s Facebook group, or Make A Wish’s national Facebook group. Those sites are barely just the beginning of the volunteer world.